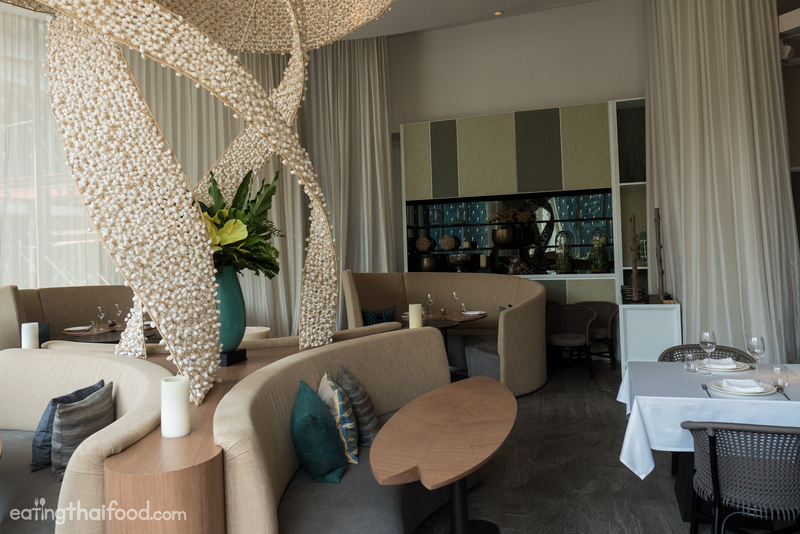 One of the best Thai fine dining restaurants in Bangkok you can eat at is Paste. The dishes they prepare are modern in style, yet traditional in roots, using extremely high quality ingredients paired with an acute knowledge of flavor balance and composition. 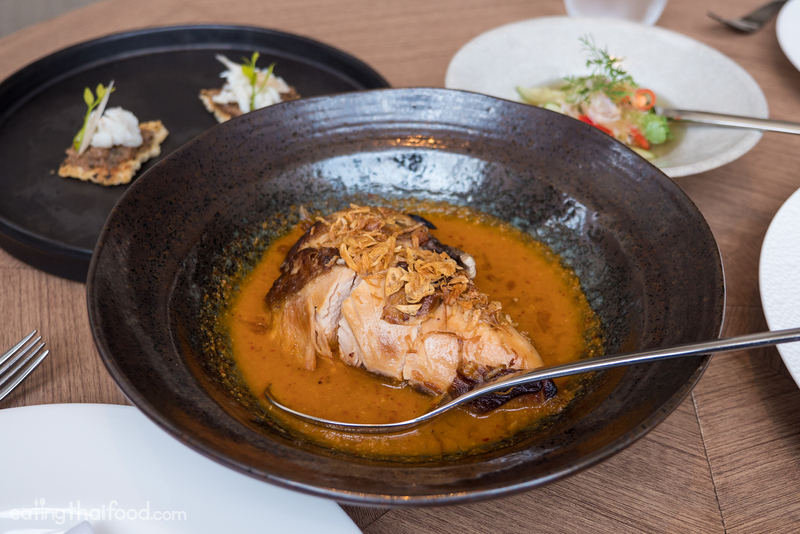 In this blog post I’m going to share with you all the details about this incredible high end Thai restaurant in Bangkok. NOTE: And as of 2018, congratulations to Paste for being awarded a Michelin Star, and to Chef Bee Satongun for being awarded Asia’s Best Female Chef 2018 by Asia’s 50 Best Restaurants. One of the things I love about Paste is that their goal is to cater to a Thai palette — not to adapt the tastes and profiles of their dishes to (necessarily) accommodate to foreigners or tourists. Paste was recently voted as the best Thai fine dining restaurant in Bangkok by Time Out from a mostly local Thai voter base. So you can expect bolder flavors, not necessarily spicy, but rather packed with flavors, spices, herbs, and even flowers. I had a chance to go back in the kitchen, and even though I’ve been eating in Thailand for many years, there are still some regional Thai herbs and ingredients in the Paste kitchen that I’ve never seen before. 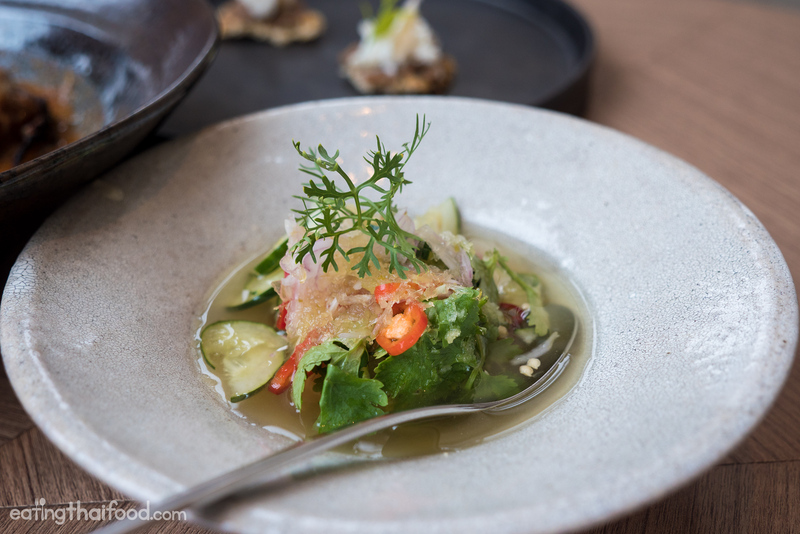 For their acute attention to details, use of high quality ingredients, and progression of Thai cuisine, Paste was awarded a much deserved Michelin Star in 2018! 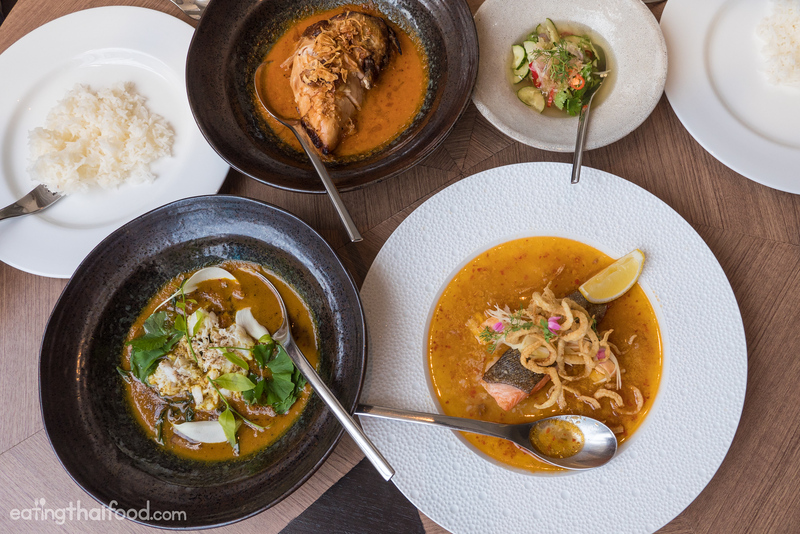 Paste Bangkok serves what is modern Thai food, many dishes which have been adapted from Royal Thai recipes or ancient family home recipes with Thai regional influence. 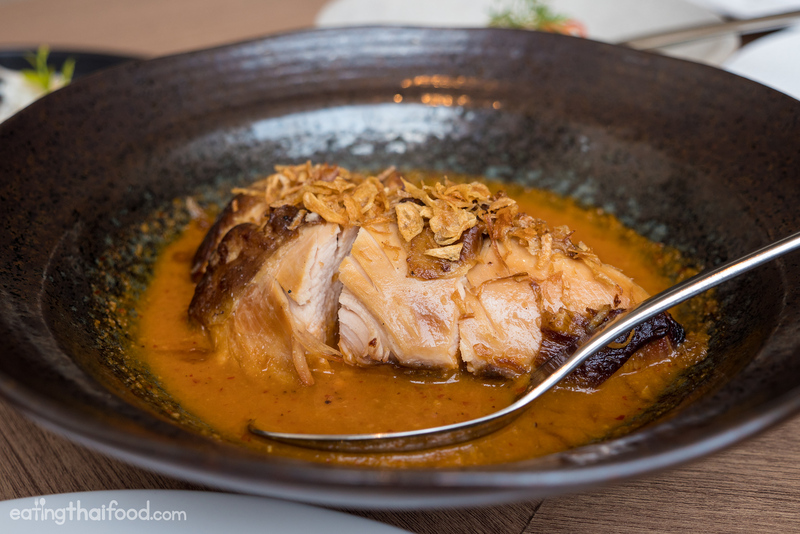 I’ve been friends with Chef Jason Bailey and Chef Bee Satongun since they first opened Paste Bangkok years ago over at a different location at Thong Lo (which has since been closed, you can read my prior review here). But I had not had a chance to eat at their new location at Gaysorn Shopping Centre, so my wife Ying and I were excited to eat at the Gaysorn location. 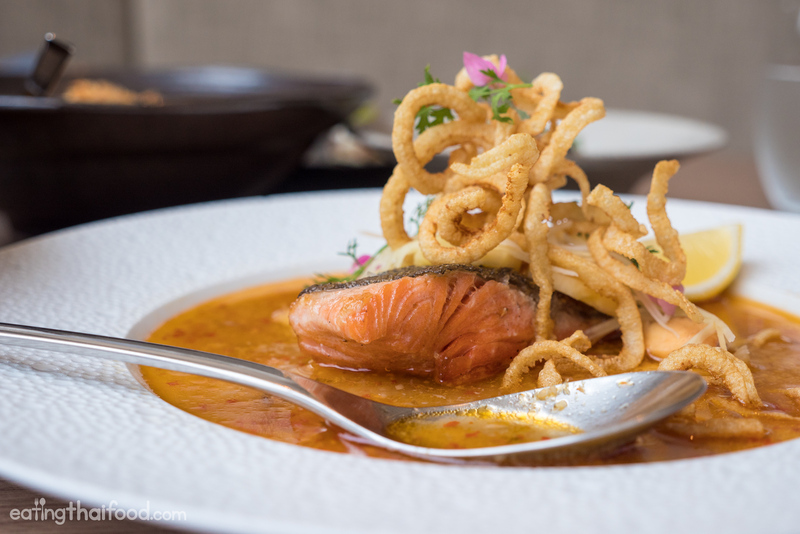 The first dish of our meal was ocean trout in an herbal sauce with white turmeric, chicken and shrimp stock, and pork crackle (ปลาเทร้าต์น้ำยากุ้ง). The trout was pan-fried in oil, so the edges were slightly crispy, and then it was delicately doused in the wonderful herbal broth. The broth was somewhere between a sauce and a soup, so I ate a piece of fish with rice and followed with a spoon of the herbal broth. The flavor was all in the herbal broth, which was sour, but not eye-squinting sour, sweet to balance, and with a garlicky slightly gingery taste from the white turmeric. Next dish we ordered was a Southern Thai style curry with shell-less spanner crab (แกงปูจั๊กจั่นปักษ์ใต้กับพริกไทยดำ). 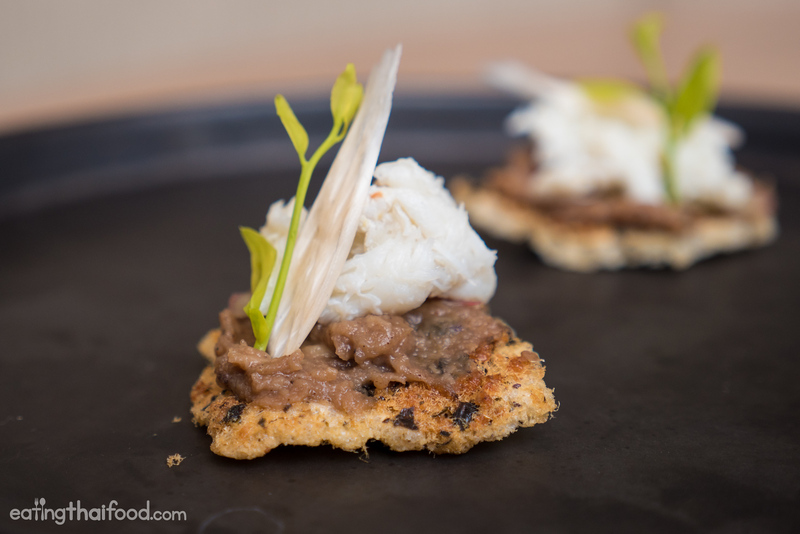 Anytime I have the chance to eat shell-less crab (ok, or even shell on crab), I’m very excited. Crab is one of my favorite single things in the world. 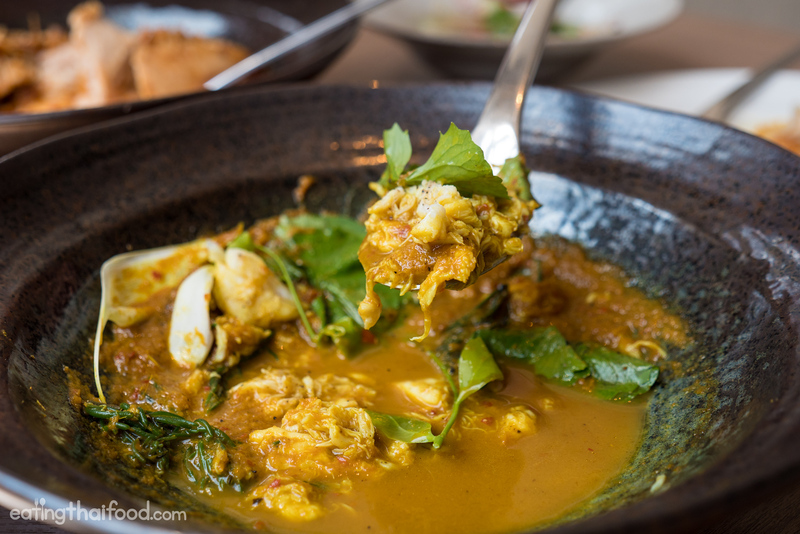 In addition to the crab, the curry included pennywort leaves, black pepper, and a type of sea asparagus which in Thai is called bai chakram (ใบชะคราม). I had my first taste of this type of sea asparagus on a trip to Samut Songkram. Rather than being a pungently harsh and spicy curry like Southern Thai curries are known for being, this curry had a sweet taste, followed by layer upon layer of spices, including turmeric and black pepper, finally followed by the freshness of the pennywort leaves and sea asparagus. 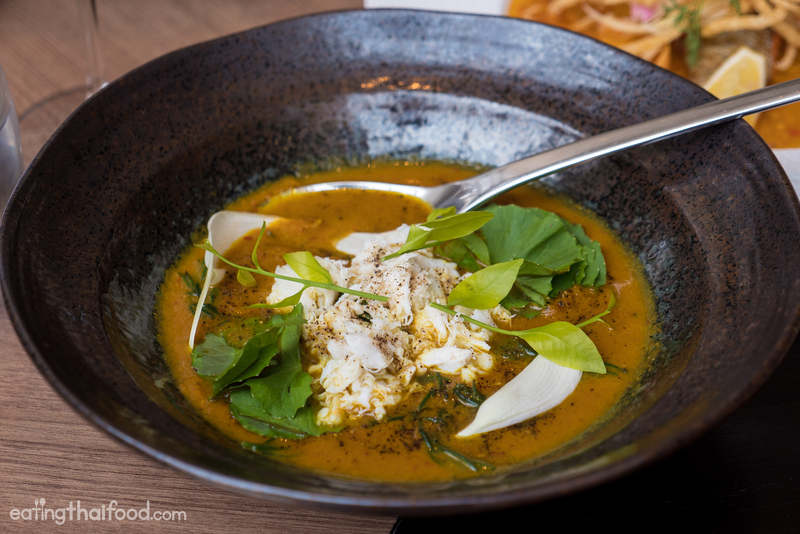 I’m not usually into sweet flavors, but the sweetness of this curry was sweet in a very mellow kind of way, and it blended amazingly with the spicy and the naturally sweet crab meat. I thought it was an amazing dish. For our final dish, we had a type of Southern Thai curry made with salted brined chicken (แกงไก่กอและ). In Thai the dish is called “gaeng gai galae (แกงไก่กอและ),” and in the South of Thailand gai galae (ไก่กอและ) is a type of grilled chicken with a coconut bbq sauce. So at Paste Restaurant in Bangkok they’ve sort of re-interpreted it into a curry. I was in the kitchen at Paste, so I got to see them prepare this dish. The recipe started with 4 hour sous-vide chicken, that was then tossed on the grill, and smoked over dry coconut husks while being basted with a coconut milk mixture. After it was finished grilling, it was then combined with the orange colored sauce that’s typically associated with gai galae (ไก่กอและ), and sprinkled with crispy shallots. That sous-vide process sealed in the flavor and juices, and even when I stuck my fork into the chicken, I could feel how juicy and bouncy it was. The flavor of the sauce was salty, sweet, and nutty, with a hint of a dry chili taste, an incredible creamy richness, and an insane smokiness that almost reminded me of bacon. The grilled chicken curry was also served with a side pickle, which was sour and sweet, with refreshing herbs and thinly sliced cucumber. This was a good addition the the chicken to switch up the richness of the thick coconut cream based sauce. It was delicious. 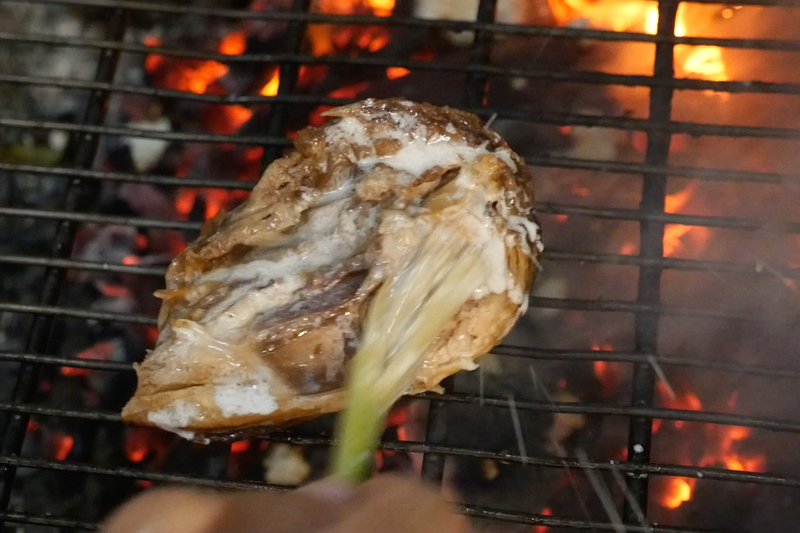 Press play to watch the full video of the meal… and even see the chicken grilling! Paste Bangkok is a high-end fine dining Thai restaurant in Bangkok located at Gaysorn Shopping Centre. 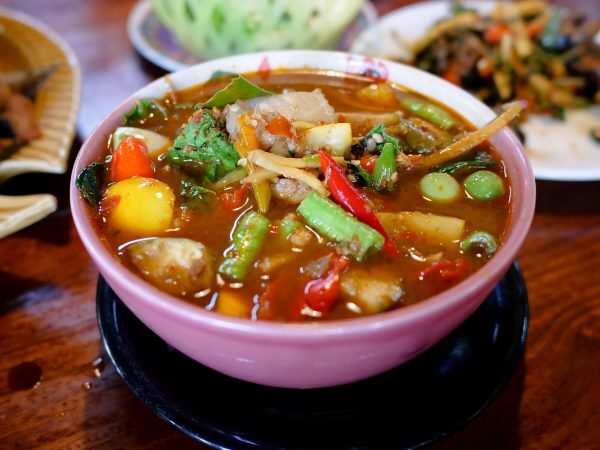 Many of the Thai dishes on their menu include complex Thai Royal and Thai family recipes which have been refined in the Paste kitchen. 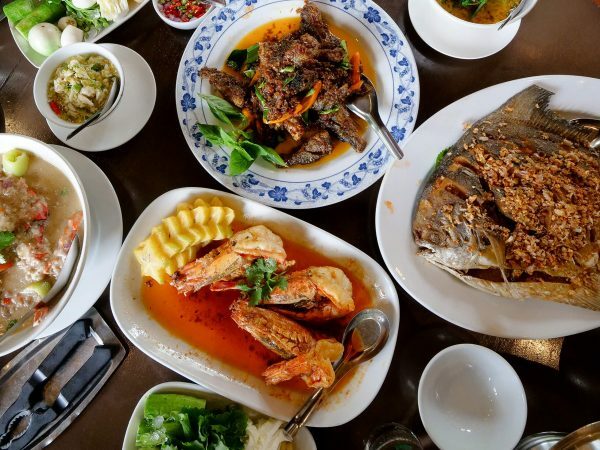 Some Thai food fine dining restaurants in Bangkok serve dishes that look fancy, but have no depth of flavor and fail to preserve Thai taste. 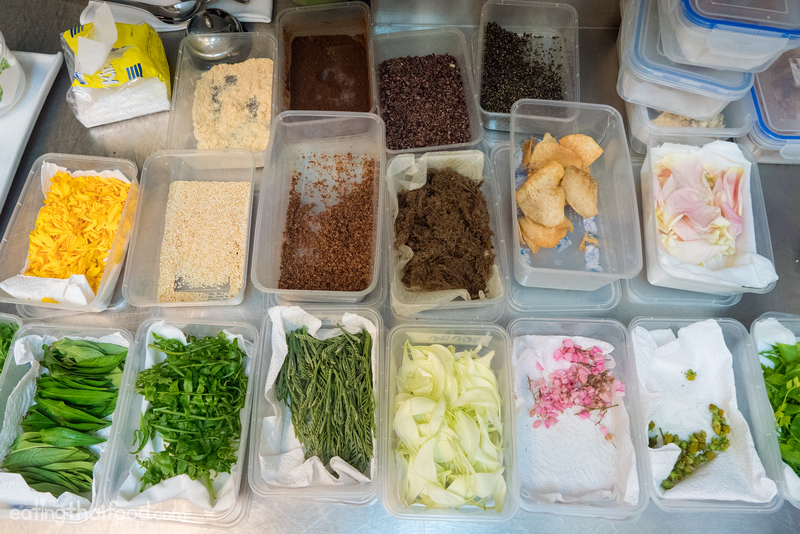 What I love most about Paste is that you can be certain that for each and every dish you order, a huge amount of research, practice, and experimenting has gone into it, ensuring that the taste is fully Thai, yet with a modern touch. NOTE: For this meal I didn’t pay for the food because Chef Jason is a good friend of mine. But this is not a sponsored post. I’m actually the one who asked Chef Jason if I could come in to eat and make a video. By the way, if you haven’t seen the video, you can watch it here. I really want to try fish head cracker, look really yummy. What’s kind that fish ? Thank you. Excellent taste and video. Thank you for reading Nui! Could you not at least wear a nice shirt? Great , time in bkk wish I could have found all your recommended stalls ,need to make more detailed mappings on finding them.? Also can you post more hands on receipes, for I can’t find good Thai restraunts in the OC. Thanks Mark ! Keep up the good work! Hey Ken, thank you for reading. I’ll be working on a better mapping system. And many more recipes coming soon! Thank you Mark for doing all the ground work so that visitors like me know where to go and what to expect. Hey Lardy, you’re fully welcome, I love it. Thank you for your support! Thank you Mark, I love all your videos. 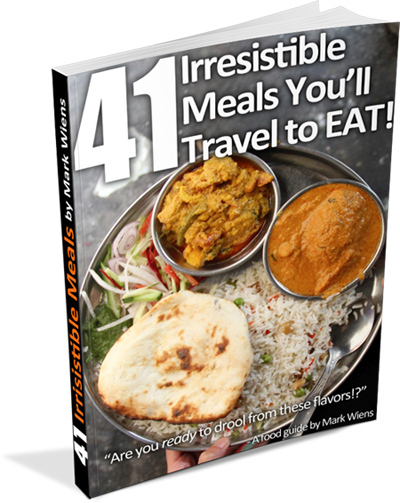 I eat and travel along with you, and enjoy it all without leaving my house ! (sadly!) So keep up the good work… looking forward to seeing more great stories. Thank you so much Helen for all your support! Hey Ted, thank you very much. I believe it’s because they added dry coconut husk to the grill as they were grilling and so that was the smoke coming from the grill. Not sure what was all in the herbal sauce… I think a stock of shrimp and chicken, with garlic, maybe lemongrass, and white turmeric. Thanks! Hi Mark, thank you for this post, and video. I am excited to try this place the next time my wife Wan and I are in Bangkok (we are in Ayutthaya). 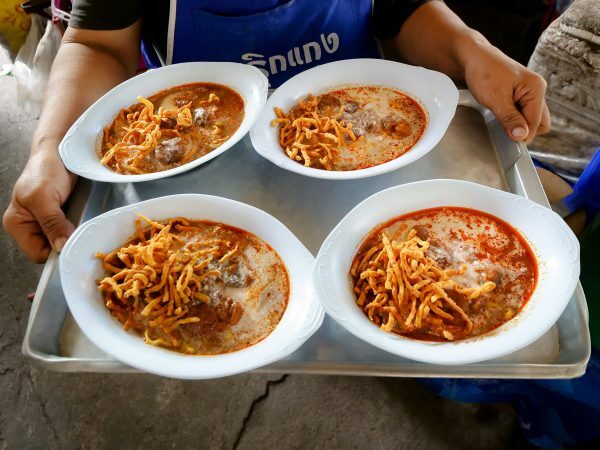 I actually like a lot of Southern Thai cooking, but my wife is from Nong Khai and prefers Isaan style food, especially from street vendors lol. Thank you very much Gray, it’s a really great high end restaurant to try for truly authentic and modern Thai food. Hope you’re having a great time in Thailand! I thorougghly enjoyed seeing your recipes.